Listen to Morning Edition on NPR who reported today on the arrest of Kosher slaughterhouse manager Sholom Rubashkin. Attorney Nathan Lewin speaks in defense of Rubashkin. No. Kay Hagan, North Carolina Democrat and Senate candidate, is not a Jew. Also, she is not an atheist, contrary to the mud-slinging of her opponent Elizabeth Dole. (CNN) -- Kay Hagan erupted in anger Thursday over a television ad from Sen. Elizabeth Dole suggesting Hagan is "godless." "I think Elizabeth Dole has just gone to the lowest of the lows," Hagan said of the ad during an appearance on a talk show on WPTF-AM in Raleigh, North Carolina. "This is an attack on my Christian faith." Hagan, who described herself as a Sunday school teacher and an elder at a Presbyterian church in Greensboro, North Carolina, urged Dole to "pull this kind of despicable ad." Hagan, who is challenging Dole's re-election bid, filed an application in a Wake County, North Carolina, court Thursday, seeking permission to file a complaint within 20 days, after the election is over. "The advertisement purposely misstates facts about the plaintiff," said the three-page application, which was filed in District Superior Court. In the 30-second ad, a narrator says that a leader of the Godless Americans Political Action Committee recently held a "secret fundraiser" for Hagan. The ad then shows members of the group, which promotes rights for atheists and the separation of church and state, declaring that neither God nor Jesus exists. "Godless Americans and Kay Hagan," the ad continues. "She hid from cameras. Took 'Godless' money. What did Kay Hagan promise in return?" The ad ends with a picture of Hagan and a voice that sounds like hers declaring, "There is no God." But the application said Hagan never made that statement or accepted money from the group. Lawyers representing Dole and her campaign defended the ad Thursday as "100 percent factually accurate and truthful." The campaign for the GOP incumbent said it based its claims on Hagan's attendance at a fundraiser in the home of a GAPAC adviser. "Kay Hagan attended a fundraiser event in Massachusetts in September held in the home of two anti-religion activists, Wendy Kaminer and her lawyer husband, Woody Kaplan," Dole's attorneys said in a letter to Hagan's lawyer. They described Kaplan as a founder and advisory board member of the GAPAC. The letter said Kaplan and Kaminer were advisory board members of The Secular Coalition for America, which it described as "the national lobby for atheists, humanists, freethinkers and other nontheistic Americans with the unique mission of protecting their civil rights." The lawyers also said Kaplan gave $2,300 to Hagan's campaign. "This is politics of the worst kind, and I know it has been rejected by North Carolinians at every level," said Hagan. Polls suggest Hagan -- a Democratic state senator from Greensboro who began the race at a major financial disadvantage to Dole -- is slightly ahead of the incumbent. This story mixes ancient archaeology with modern politics. Should you be doing this on day one of announcing a significant find? JERUSALEM (Reuters) - Archaeologists in Israel said on Thursday they had unearthed the oldest Hebrew text ever found, while excavating a fortress city overlooking a valley where the Bible says David slew Goliath. The dig's uncovering of the past near the ancient battlefield in the Valley of Elah, now home to wineries and a satellite station, could have implications for the emotional debate over the future of Jerusalem, some 20 km (12 miles) away. 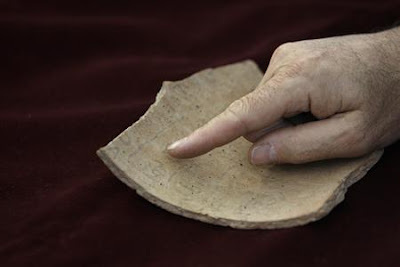 Archaeologists from the Hebrew University said they found five lines of text written in black ink on a shard of pottery dug up at a five-acre (two-hectare) site called Elah Fortress, or Khirbet Qeiyafa. Experts have not yet been able to decipher the text fully, but carbon dating of artifacts found at the site indicates the Hebrew inscription was written about 3,000 years ago, predating the Dead Sea Scrolls by 1,000 years, the archaeologists said. Several words, including "judge," "slave" and "king," could be identified and the experts said they hoped the text would shed light on how alphabetic scripts developed. In a finding that could have symbolic value for Israel, the archaeologists said other items discovered at the fortress dig indicated there was most likely a strong king and central government in Jerusalem during the period scholars believe that David ruled the holy city and ancient Israel. Modern-day Israel often cites a biblical connection through David to Jerusalem in supporting its claim, which has not won recognition internationally, to all of the city as its "eternal and indivisible capital." Palestinians, saying biblical claims have been superseded by the long-standing Arab population in Jerusalem, want the eastern part of the city, captured by Israel in a 1967 war, to be the capital of the state they hope to establish in the West Bank and Gaza Strip. "The chronology and geography of Khirbet Qeiyafa create a unique meeting point between the mythology, history, historiography and archaeology of King David," said Yosef Garfinkel, the lead archaeologist at the fortress site. Coleman is desperate. This maneuver has "backfire" written all over it. Gee Norm. Thanks for the heads-up. I thought you were just a Bush-supporting war-monger. Now I know that you are corrupt too. Sen. Norm Coleman's campaign, charging that recent Al Franken TV and radio ads contain lies about Coleman, is suing Franken's campaign for violating state campaign law. Mark Drake, a Coleman spokesman, said this morning at a State Capitol news conference that statements that Coleman has been named "the fourth most corrupt senator in Washington" and lives in a Washington apartment "almost rent free" are patently false. "Al Franken has chosen to push the lines of believability far beyond the bounds of truth," Drake said. The claim that Coleman ranks fourth among senators in corruption is based on a recent list pulled together by the Washington watchdog group Citizens for Responsibility and Ethics in Washington (CREW), which lists three senators among "the 20 most corrupt members of Congress" and then gives Coleman "dishonorable mention." CREW never actually names Coleman "the fourth most corrupt senator," Drake said, nor is there any mention of the fact that CREW is led by Melanie Sloan, who has worked for high-profile Democrats and appeared dozens of times on Franken's Air America radio show. As for Coleman's D.C. living quarters, Drake said that Coleman pays $600 a month to rent a bedroom and bath in a rowhouse owned by his longtime friend and telemarketer Jeff Larson. Although the campaign released copies of Coleman's lease and rent checks last summer, it has not yet produced proof that the senator pays for his share of utilities in the house. This news is humiliating for all of us who honor and observe the laws of kosher foods. CEDAR RAPIDS, Iowa - A former manager of a kosher slaughterhouse raided by federal immigration agents in May has been arrested. Immigration agents arrested Sholom Rubashkin, son of company owner Abraham Aaron Rubashkin, in Postville on Thursday. The 49-year-old will face charges of conspiracy to harbor undocumented immigrants for financial gain, aiding and abetting document fraud and aiding and abetting aggravated identity theft. Agents raided the Agriprocessors plant on May 12, arresting 389 people in what officials said was one of the largest single-site immigration busts in U.S. history. Dennis Prager is a reactionary neo-conservative Jewish radio personality. OK with me. Everyone in this country deserves an equal opportunity to make a living. According to Keith Olbermann, Prager said in a speech at Orchestra Hall in Minneapolis that "equality" is not an American value. I won't stoop so low as to even try to explain how wrong Prager is on this issue. So, let me simply add another award for Mr. Prager. We declare him this blog's, "Worst Jew in the World." Will Big Oil Bush Save Electric Car General Motors? A Monday Morning writer begs a question that's naive beyond any belief. As if, the White House will do something to save GM? Not after it announced production of an electric car called the Volt scheduled for 2010. GM can cancel the Volt and maybe get Bush backing. Otherwise - and mark these words - Bush will make sure GM goes bankrupt as his last act in office. The U.S. government is looking for ways to facilitate a merger between General Motors Corp. (GM) and Chrysler LLC, in the hopes of keeping the once vibrant industry afloat during a time of crisis. But Uncle Sam’s credit card is close to maxed out and a bailout for the auto industry could open the door for other troubled industries to come calling. Detroit’s “Big Three” automakers – GM, Chrysler, and Ford Motor Co. (F) – are in need of government assistance after being pushed to the brink of bankruptcy by slumping sales and increased foreign competition. GM has been in talks with Cerberus Capital Management LP about buying Chrysler since September. But GM’s inability to secure financing at a time when credit is hard to come by and auto sales are in decline has left GM with few options other than appealing to the government. GM spokesman Greg Martin said Monday that the company has asked the U.S. Treasury to broaden recently passed legislation, intended to bolster banks and financial institutions, to include auto companies. BOSTON - A prosecutor said Tuesday he is investigating whether criminal charges should be filed after an 8-year-old boy accidentally killed himself while firing an Uzi submachine gun at a gun fair in western Massachusetts. Christopher Bizilj of Ashford, Conn., shot himself in the head when he lost control of the 9mm micro submachine gun as it recoiled while he was firing at a pumpkin. Police have said the shooting at the Machine Gun Shoot and Firearms Expo at the Westfield Sportsman's Club on Sunday was an accident. Let me save you some time. Yes it is a reckless and wanton act. Morningstar's Kathman has never heard of a religious investment fund aimed at Jews. Religious Jews are not, however, exempted from observing biblically-derived market etiquette. Aaron Levine, head of the economics department at New York's Yeshiva University, says that significant direct investment in a tobacco company "would be considered an encouragement of wrongdoing on a grand scale." Yet, he believes, investing in a mutual fund with a small stake in tobacco might be acceptable. The same, however, does not apply to a weapons company: "Regarding direct danger to life, there are no small percentages," he says. Levine also notes that Jews are encouraged to involve themselves in enterprises that (in rabbinic language) "produce the good settlement of the earth." Judaism then is clear. Significant direct investing in cigarettes is definitely wrong! New York Times' Mark Bittman prepares his mother's classic Kasha Varnishkes. IMHO nothing sounds more Jewish than kasha varnishkes! We've been supporting Al Franken for the senate for more than two years. I was saddened to see the Star Tribune mistakenly endorse Norm Coleman. That's one of the straws in Minnesota politics that might tip the balance against Franken in this close race. The good news is that Obama is way out ahead in Minnesota. His coattails may be longer than pollsters can measure. So I am still optimistic. Vote for Al Franken! The authentic nice Minnesota Jewish boy. The Star Tribune reports that Al Franken has raised $800,000 for his PAC pointing out that, "The potential 2008 U.S. Senate hopeful is helping DFLers and candidates around the country." This also bodes well for his 2008 Senate race against former NY Jew Norm Coleman. Franken quipped about that, "If I do run against Norm Coleman in '08, I'll be the only New York Jew in the race who actually grew up in Minnesota." I met Al several times at the NW Tennis and Swim Clubs when we were living in Minnesota. He's a good family man and a down-to-earth politician. I share many of his liberal views. We will follow his odyssey to Washington where we believe he will make a big difference. And Al is sharp in his media criticism. In the video-audio clip below he, "skewers Lanny Davis for his letter to the Wall Street Journal accusing liberals, Kos, and other bloggers of anti-Semitism"
All I can say to students at this college is - you chose to attend the wrong college. No institution of higher learning worth its salt would shy away from political speakers during this season and before the most important election in a generation or more. The Wildcats? Hardly. More like the Scaredycats. The furor over rejecting politically oriented speakers at the College of St. Catherine is showing no signs of slowing down. An online student petition denouncing the St. Paul school’s decisions has collected nearly 200 signatures, on-campus demonstration is planned for later this morning and school administrators are meeting with students this afternoon.The developments follow last week’s news that the all-female Catholic school turned away visits by conservative commentator Bay Buchanan, a leading supporter of Republican presidential candidate John McCain, and former Democratic presidential candidate Hillary Clinton. The former First Lady is a campaign trail regular on behalf of Barack Obama, her party’s nominee for the White House. St. Kate’s administrators said that the two speakers, as well as Democratic U.S. Senate candidate Al Franken of Minnesota, were denied speaking opportunities on campus this election season because the school was worried that it couldn’t provide an equal amount of opportunity to both sides of the political spectrum. Alaska's founders were optimistic people, but even the most farsighted might have been stretched to imagine this scenario. No matter the outcome in November, this election will mark a signal moment in the history of the 49th state. Many Alaskans are proud to see their governor, and their state, so prominent on the national stage. Gov. 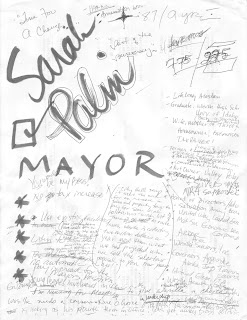 Palin's nomination clearly alters the landscape for Alaskans as we survey this race for the presidency -- but it does not overwhelm all other judgment. The election, after all is said and done, is not about Sarah Palin, and our sober view is that her running mate, Sen. John McCain, is the wrong choice for president at this critical time for our nation. Since his early acknowledgement that economic policy is not his strong suit, Sen. McCain has stumbled and fumbled badly in dealing with the accelerating crisis as it emerged. He declared that "the fundamentals of our economy are strong" at 9 a.m. one day and by 11 a.m. was describing an economy in crisis. He is both a longtime advocate of less market regulation and a supporter of the huge taxpayer-funded Wall Street bailout. His behavior in this crisis -- erratic is a kind description -- shows him to be ill-equipped to lead the essential effort of reining in a runaway financial system and setting an anxious nation on course to economic recovery. Sen. Obama warned regulators and the nation 19 months ago that the subprime lending crisis was a disaster in the making. Sen. McCain backed tighter rules for Fannie Mae and Freddie Mac, but didn't do much to advance that legislation. Of the two candidates, Sen. Obama better understands the mortgage meltdown's root causes and has the judgment and intelligence to shape a solution, as well as the leadership to rally the country behind it. It is easy to look at Sen. Obama and see a return to the smart, bipartisan economic policies of the last Democratic administration in Washington, which left the country with the momentum of growth and a budget surplus that President George Bush has squandered. Sen. McCain describes himself as a maverick, by which he seems to mean that he spent 25 years trying unsuccessfully to persuade his own party to follow his bipartisan, centrist lead. Sadly, maverick John McCain didn't show up for the campaign. Instead we have candidate McCain, who embraces the extreme Republican orthodoxy he once resisted and cynically asks Americans to buy for another four years. It is Sen. Obama who truly promises fundamental change in Washington. You need look no further than the guilt-by-association lies and sound-bite distortions of the degenerating McCain campaign to see how readily he embraces the divisive, fear-mongering tactics of Karl Rove. And while Sen. McCain points to the fragile success of the troop surge in stabilizing conditions in Iraq, it is also plain that he was fundamentally wrong about the more crucial early decisions. Contrary to his assurances, we were not greeted as liberators; it was not a short, easy war; and Americans -- not Iraqi oil -- have had to pay for it. It was Sen. Obama who more clearly saw the danger ahead. 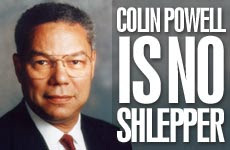 The unqualified endorsement of Sen. Obama by a seasoned, respected soldier and diplomat like Gen. Colin Powell, a Republican icon, should reassure all Americans that the Democratic candidate will pass muster as commander in chief. On a matter of parochial interest, Sen. Obama opposes the opening of the Arctic National Wildlife Refuge, but so does Sen. McCain. We think both are wrong, and hope a President Obama can be convinced to support environmentally responsible development of that resource. Gov. Palin has shown the country why she has been so successful in her young political career. Passionate, charismatic and indefatigable, she draws huge crowds and sows excitement in her wake. She has made it clear she's a force to be reckoned with, and you can be sure politicians and political professionals across the country have taken note. Her future, in Alaska and on the national stage, seems certain to be played out in the limelight. We are Israelis and Israeli-Americans who believe Barack Obama will be good for America and good for Israel. In such dramatic times a leader who is able to employ intelligent diplomacy hand in hand with a strong defense is crucial to our future. We urge the Jewish community to hear our voices. 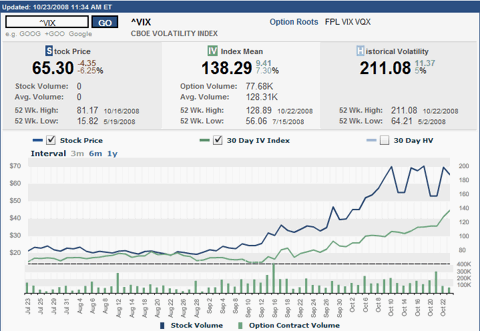 If you look real intently at the right side of the VIX volatility index chart below you see the pattern...oh boy it has been a long and stressful time for those investors. Just as it seemed as if the end of the world was nearing, I am pleased to report a rare Batman pattern forming in the VIX (and in the implied volatility of the SPX and SPY). The chart below shows the right wing formed two weeks ago, just as panic was first setting in; the head was completed last week, when the situation looked most bleak; and now the left wing is taking shape as the forces of good seek to gain the upper hand over the forces of evil. Once the batman pattern is completed, perhaps as soon as tomorrow, I can only conclude that Gotham City will likely be spared the full force of the financial Armageddon that appears to be bearing down on us. Yes Park Slope ladies raised money for Barack by gettin' Palin hairstyles. A truly Brooklyn way to support their candidate! We look back nostalgically to the good old days (pre Jesse Ventura) when there was a semblance of normalcy in Minnesota state government. This bit of good news is welcome. Citing Michelle Bachman as a factor, Governor Arne Carlson has crossed over party lines to jump on the Barack Obama bandwagon. ST. PAUL, Minn. (AP) — Arne Carlson, a former Republican governor in Minnesota, has endorsed Democratic presidential candidate Barack Obama. Carlson said Thursday that the Illinois senator's stances on the Iraq war, the economy and green energy goals won him over. Carlson, who served from 1991 to 1998, also cited recent comments by GOP Congresswoman Michele Bachmann questioning whether politicians have "pro-America or anti-America views." "Regardless of our party, regardless of our partisan inclinations, there is no interest more compelling than the interest in the well-being of the United States," Carlson said at a gathering of Obama supporters at the state Capitol. Carlson added, "He has laid out for this nation a vision for a national purpose." Carlson was considered a moderate Republican during his two terms in office. This isn't the first Democrat he has backed for political office. He said he considers himself "a Republican maverick." Minnesota's current governor, Tim Pawlenty, is a strong supporter of GOP hopeful John McCain. Carlson said he wasn't approached about endorsing McCain or asked to remain neutral. "I think we have in Barack Obama the clear possibility of a truly great president," he said. "I would contend that it's the most important election of my lifetime." Carlson also took aim at Minnesota U.S. Rep. Michele Bachmann, saying that her controversial remarks of the past week, suggesting Obama may have anti-American views, had led him to endorse the Democratic nominee. After hearing Bachmann's comments, Carlson said he telephoned former Vice President Walter Mondale, the Minnesota Democrat, to tell him of his plan. At one point, Carlson compared Bachmann's statements to the tactics of Joseph McCarthy, the Wisconsin senator during the 1950s who helped define an era when the patriotism of many Americans was publicly questioned. "I don't want Minnesota to continue to be seen in the national picture as some sort of a land that has these rather strange views -- we don't," he said. The former governor said Obama's policies on the Iraq war, economic issues facing the middle class and alternative energy solutions meshed with his own views. "I think the disappointing part of the McCain campaign has been its inability to develop a national vision," he said. Was Pope Pius a coward or a saint? asks Ben Macintyre, columnist for the Times of London. At this blog we've had this issue on our agenda for some time. And now I am happy to report that we have solved the issue of whether the church ought to canonize Pius as a saint. I came up with this solution while brushing our teeth last night. I find the rhythmic motions of my tooth-brushing to stimulate problem solving by releasing my right brain holistic ideas and insights and allowing them to commingle with my right brain judgmental concerns. The church simply needs to establish a new category of sainthood for Pius! Now of course the church will not be able to bestow this title on Pius with the same fanfare that they do for other more public and vocal saints. But then again they also will not need to open up the archives of the church.... and answer all those nagging factual and historical questions. Mr. Macintyre's essay that follows below is more nuanced and diplomatic than my proposition and therefore, of course, cannot suggest a pointed, powerful and proper solution, like the one I have put forward just now. Was Pope Pius a moral coward or a saint? When I lived in Paris, I often pondered the question posed by these small memorials: what would I have done? Would I have done anything? Some Frenchmen and women actively collaborated during the war; many quietly acquiesced to protect themselves and their families. Those who chose to resist fascism did so in different ways: some secretly and discreetly, some with guns and actions, others with words. Those who spoke up, and out, were perhaps the bravest of all: the saints, and the martyrs. Exactly 50 years after the death of Pope Pius XII, supporters of the wartime pontiff are demanding his beatification, the last step on the road to sainthood, reigniting a long-running battle over whether he did enough, early enough, to condemn the persecution of Jews. 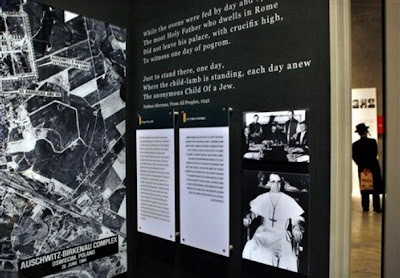 The Yad Vashem Holocaust Museum in Israel carries a deliberately provocative depiction of the Pope's wartime role, including him among the “unjust”. Hardline supporters of Pius have tried to ram through the process of sainthood with little regard for Jewish sensitivities. Pius has been condemned as “Hitler's Pope” by some critics and lauded by Pope Benedict XVI as a great leader. For all the fury and posturing, the story is essentially about how one very powerful man responded to the most pressing moral question of the age. This is not some distant historical dispute among scholars. It is a defining issue that asks, just as insistently as those Paris plaques: what would you have done? Eugenio Pacelli, who became Pius XII in 1939 and reigned at the Vatican until 1958, was an extraordinary man: compassionate, pious and utterly dedicated to his faith. He was no anti-Semite; far from being a Nazi sympathiser, he loathed Hitler with righteous passion, considering him “an untrustworthy scoundrel and a fundamentally wicked person”. In Pope Benedict's words, Pius “worked secretly and silently” to “avoid the worst and save the greatest number of Jews possible”. There could be no direct orders to intervene, since the Vatican was officially neutral, but thousands of Jews were saved thanks to the Catholic Church, hidden in churches or issued with false passports. But set against all this is the silence of the Pope. By the end of 1942, Pius had learnt details of the Holocaust's ghastly progress from at least nine different countries. Hungarian, Danish and Bulgarian church leaders spoke out, yet Pius made no formal protest or condemnation. A single sentence in his 26-page Christmas message of 1942 lamented “persons who, for no fault of their own, sometimes only because of their nationality or race, have been consigned to death”. He made no specific mention of the Jews, Hitler or the genocide then under way. Under mounting pressure to make a stand, Pius was privately appalled but publicly cautious, even equivocal. The British envoy to the Holy See was astonished that the Pope seemed more concerned with the possibility that Rome might be bombed than “Hitler's massacre of the Jewish race”. One Foreign Office memo described Pius XII as the “greatest moral coward of our age”. That is unfair. Pius's silence came not from cowardice, but calculation, his perceived duty to his Church, and fear of provoking Hitler to even greater crimes, endangering non-Aryan Catholics and Catholicism itself. “No doubt a protest would have gained me the respect and praise of the civilised world. But it would have submitted the Jews to an even worse fate,” he reflected. “The Pope cannot speak. If he spoke, things would be worse.” But how, in December 1942 with the gas chambers and crematoriums working day and night, could things possibly have got any worse? The argument that a condemnation of Nazi brutality would have made that brutality worse is unprovable. Even the most powerfully worded encyclical might have had little effect on the accelerating brutality of the Nazi high command, but it would have placed the Church firmly on the moral high ground, and might even have galvanised anti-Nazi feeling among German Catholics. After the Liberation of Rome, Pius could have threatened senior Nazis with excommunication. After the war, he could have explained why, as a virtual prisoner within the Vatican, he had opted not to make a solemn formal protest against the greatest crime of all time. He did not, offering neither regrets nor rationalisation for his silence. Pius left no diary or notebook that we know of to explain his thinking. The Vatican archives that might finally answer these questions remain sealed, although a single word from Pope Benedict would open them. So far, the only evidence released has tended to bolster Pius's credentials for beatification. As a group of prominent Christian-Jewish scholars pointed out in a letter to The Times this week, without all the evidence there can be no consensus. The silence of the archives compounds the silence of Pius, and fatally undermines his claim to sainthood. Looking at those Paris plaques to resistance fighters, I wonder again whether I would have offered a similar reason to remain silent: fear for my family, fear of reprisal, fear of unleashing something worse. Pius argued that it would have been irresponsible to protest openly; you and I might well have made the same excuse. But irresponsibility is a part of true courage. Pius suffered moral agonies over his decision; he acted for the best, as he saw it, in an excruciatingly difficult situation; he did much to help the Jews, but not enough. All this makes Pius XII fascinating, fallible and important. But it does not make him a saint. Video: Is MN Representative Michele Bachman a Jesus Freak? Yes, as this video suggests, Michele Bachman, the US Representive from Minnesota who called Barack Obama "anti-American" on the Hardball Chris Matthews show last Friday is a total Jesus Freak who is "Hot" for Jesus. I do not want to know what that means! We condemn these disrespectful political acts in our home town. Two longtime township residents backing opposing candidates in the presidential election campaign have become victims of anonymous attempts to silence their political views. Yigal Marcus told Teaneck Suburbanite that a McCain/Palin sign was removed from his front lawn in the early morning on Oct. 6. Marcus said the sign was intact when he left his Dickerson Road home at 6 a.m. When he returned less than two hours later, the sign was gone. He noted that an Obama sign on the house across the street was untouched. There was clearly a choice. It is a fair assumption that whoever took the McCain sign was trying to quell Obama opponents. A lifelong township resident, Marcus said he has ordered a hundred additional McCain/Palin signs which he plans to distribute to his neighbors. But he said that the issue was not the particular candidate but the threat to free speech. "It is unacceptable behavior to steal a sign and not allow people to freely express their opinions. It would be just as bad if it had been an Obama sign. It is an act that undermines democracy," Marcus said. On Riverview Drive, Harold Salwen reported that an Obama sign was removed from his front lawn. Salwen, who has lived in the same house at the corner of Riverview Drive and River Road since 1959, then set up a second sign on his lawn. The following day that sign was gone. Salwen found parts of the frame on Churchill Road almost directly across from his home. 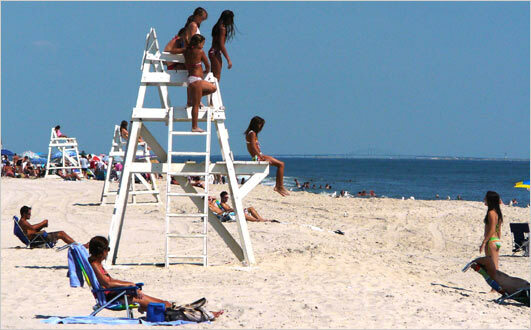 A symbolic border has ripped the usually peaceful village of Westhampton Beach apart. The anger was well illustrated on Sunday at a meeting organized by the Jewish People Opposed to the Eruv. An eruv is an invisible boundary that allows Orthodox Jews to carry children and belongings on the Jewish Sabbath. Tensions have been escalating since February after an application was submitted by Rabbi Marc Schneier of the Hampton Synagogue for the creation of an eruv in the village. Led by Arnold Sheiffer, founder and head of the JPOE, the event was the group's second gathering as members sought to discuss its mission and further explain why they are opposed to the eruv. There were rumors circulating that Schneier may own the synagogue itself and thus would benefit from a swell of incomers on the Sabbath. If he did own it, asked one individual, how would it be possible for the synagogue to receive tax exemptions and other benefits received by houses of worship? American Jews favor Democratic presidential candidate Barack Obama by a ratio of two-to-one, according to survey results being released Monday by researchers at New York University. The data, taken from a nationwide poll conducted in early September, indicates that Jews as a group are 30 percent more likely than other white, non-Hispanic voters to support Obama. Surprisingly, the poll found that gap widened to nearly 40% among Jews who rank Israel "very high" as a factor in their choice of candidate, indicating that Israel is a key issue for Jews across the political spectrum. "Jews always look at candidates in their own camp as more sympathetic to their positions as Jews, so liberal Jews will tend to feel Obama is more pro-Israel than conservative Jews do," lead researcher Steven Cohen, a professor of Jewish social policy at Hebrew Union College, told The Jerusalem Post. "In fact, liberal Jews have an argument about why McCain is bad for Israel, just as conservative Jews have an argument for why Obama is bad for Israel," he said. "There's a tendency toward cognitive consistency." Nonetheless, support for McCain tracked support for Israel, with 58% of Jews who said Israel was very important favoring McCain. Orthodox Jews - a category that encompasses Modern Orthodox and haredi respondents, Cohen said - were the likeliest to support McCain, with 73% indicating support for the Republican over just 27% for Obama. Support for McCain was highest - 90% - among Orthodox Jews who said they socialized exclusively with other Jews, while only 60% of Orthodox respondents who said they had non-Jewish friends planned to vote for McCain. Cohen said that while New York Senator Hillary Clinton might have had an easier time attracting Jewish voters than Obama has had, he did not believe large numbers of Jewish Democratic voters would change parties in November. "I'm willing to speculate that Obama had a bit of a tougher time than Hillary - she's from New York, where most Jewish voters are, and she's familiar," Cohen said. "But if you look at the organized Jewish community, for years already you see that hardline pro-Israel Jews were arguing the Republicans were a better choice." Yet even Jews who categorized themselves as conservative Republicans were far likelier to support Obama, with 7% indicating they planned to vote for the Democrat over just 1% of non-Jewish conservative white voters. The difference was almost nil at the other end of the spectrum, where 97% of Jews who said they were liberal Democrats planned to vote for Obama, slightly more than the 96% of non-Jewish liberal Democrats. Mark Mellman, a Democratic strategist, said Obama's recent surge in national polls and in states like Florida negated the possible electoral impact of a rightward swing among Jewish voters at the margin. "The question in 2008 is, are we talking about 66% Jewish support for Obama or 75%? That's the range of difference," Mellman said. "In some years that could make the difference between winning and losing, but this year it's not likely to because so many other people are voting for Obama." At the time of the survey, slightly more than half of all Jewish voters - 51% - favored Obama, while just 25% favored McCain and 24% were still undecided. That translates into 67% for Obama versus 33% for McCain among those who had already made their choice - though Cohen estimated support for the Democrat among Jews at 75% today, based on his lead in more recent polls. National polls released Sunday by Gallup and Reuters/C-Span/Zogby indicated a three-point lead for Obama, while an expanded Gallup poll of likely voters showed Obama as much as seven points ahead. The survey, conducted by the Berman Jewish Policy Archive at NYU's Robert F. Wagner Graduate School of Public Service, was conducted by Synovate, which contacted more than 1,500 Jewish respondents in September. Another Synovate poll conducted on behalf of the American Jewish Committee in September indicated that 57% of Jews intended to support Obama, with 30% for McCain and just 13% undecided. The Yad Vashem museum displays a photograph of Pope Pius XII with a caption that says he recognized the Nazi regime and did nothing to condemn its racism, anti-Semitism and extermination of Jews. Bizarre connections fog the minds of the present Vatican leaders. Benedict stopped the sainthood process for Pius - because of the Jews? This claim is bizarre beyond words. The man cringed before the Nazis. He was no hero. He watched the Holocaust unfold from his Vatican window. He was so utterly "silent" and "secret" about saving Jews that no sainthood ever should or could be bestowed on him. The Vatican knows saints. The Vatican invented saints. Not every pope was a saint. The Vatican should admit that by dint of his own actions, by any objective estimate and evaluation, Pope Pius was not a saint. But according to the story in the Times, the actions of the Vatican on this subject are beyond bizarre. Are they now blaming the Jews for crucifying Pope Pius? More utterly bizarre according to the report: The Vatican suddenly demands that a plaque criticizing Pius be removed from the Israeli Museum Yad Vashem! Without doubt, the Church is not served by the strange actions this Pope and his minions. What now? A leader who acts in a bizarre and erratic fashion ought to resign. Will Benedict resign? Can a pope resign? ROME, Italy — Tensions heightened this weekend between the Vatican and Israel after a Vatican official said that Pope Benedict XVI had halted the beatification of Pius XII, the pope during World War II, for fear of repercussions from Jewish groups. The official, the Rev. Peter Gumpel, a Jesuit priest who is directing beatification efforts, also told the ANSA news agency on Saturday that the pope would not visit Israel until a plaque criticizing Pius was removed from Israel’s Yad Vashem Holocaust museum. After the Rev. Gumpel’s remarks this weekend, Vatican spokesmen took pains to ease the situation. Fr. Lombardi said the Vatican had raised its displeasure with Israel over the plaque at Yad Vashem, but that it wasn’t “the determining factor” in whether the pontiff travels to Israel. He said the security and political situation were more significant. In 2000, Pope John Paul II became the first pope to visit Israel. In his three years as Pope, Benedict has not yet taken that step. Today's Colin Powell endorsement seals Barack Obama's landslide victory by tilting Florida, Virgina, North and South Carolina into the Obama column. The pundits - including both Democrats and Republicans - discussing the endorsement subsequently on Meet the Press sounded like they were doing a postmortem on the dead McCain Campaign. What is really remarkable is that the landslide may carry with it a filibuster proof 60 vote majority for the Democrats in the Senate. Hey McCain: What about the Impact of Obama's Tax Increase on Joe or Josephine the $250,000 Teacher? Why didn't McCain talk about what Obama's Tax Increase will do to stifle "Joe or Josephine the $250,000 Teacher"? Oh wait. There is no teacher who earns $250,000. Update: Even the power of the Holy Kabbalah could not save Madonna's marriage. This is a perfect example of how the Kabbalah Center is helping to perfect the world through Tikkun Olam. by restoring the broken vessels and recovering the lost sparks. How lucky we are to have the great asset of the KC to make things right in this topsy turvy world for all of us poor simple folk... I guess. MADONNA and Guy Ritchie have turned to a rabbi for counselling in an effort to save their marriage. Rabbi Yehuda Berg is founder of the Los Angeles Kabbalah Centre, which practises the mystical offshoot of Judaism of which the singer is a devotee. Madonna, 49, and film director Ritchie, 39, have both spent time with Rabbi Berg since Christmas. Madonna is said to phone him two or three times a day. Ritchie, who embraced Madonna’s beliefs before their wedding at Skibo Castle in the Scottish Highlands in 2000, was rumoured to have become disillusioned with the doctrine. The rabbi has spoken of the devastating effect divorce would have on the couple’s children – their biological son Rocco, seven, adopted son David, two, and Lourdes, 11, Madonna’s daughter from her previous relationship with her personal trainer Carlos Leon. “It might be considered to be old-fashioned these days,” said the Kabbalah devotee, “but their kids do come first and both Madonna and Guy are very worried about how they would react to them splitting up. In an ironic twist, Madonna is helping to console a fellow celebrity whose wife has left him. Baseball star Alex Rodriguez has been a regular late-night visitor to her Manhattan flat. He and Madonna, who share the same New York agent, both deny they are having an affair. spiritual advice from Madonna about his marriage problems. His wife Cynthia, 34, left him just two months after the birth of their second daughter and was last week said to be in Paris with rock star Lenny Kravitz, 44. A source said: “Madonna has become his shoulder to cry on at a time when it looks as if his own marriage has vanished down the pan completely. Meanwhile, Madonna and Ritchie, who flew into New York last weekend in an effort to patch up their differences, are said to be taking their own marriage crisis “one day at a time”. A member of Madonna’s family said yesterday: “You’ve got to admire Guy for flying in and making it very obvious to everyone he does care and doesn’t want their marriage to end. What is the Archetypal Definition of Corporate Greed and Excess? This news item just about sums up the archetypal definition of corporate excess and greed. NANTUCKET, Mass. (AP) -- The co-president of financial services company Goldman Sachs is trying to sell his Nantucket estate for a record $55 million. Jon Winkelried's asking price for the 5.75 acre property, which includes two shoreline parcels, is more than double the record sale of $26.5 million set last year. The main house includes a wine room, billiard room, four fireplaces, a swimming pool and five bedrooms. The property also has a guest house and two garages. Winkelried bought the two parcels in 1999 for just under $7 million and built the main house afterward. The taxes are nearly $68,000 annually. Winkelried owned $345 million worth of common stock when he took over as co-president of Goldman Sachs in 2006. His compensation last year was $67.5 million. I am a strong supporter of Israel (though sometimes critical of specific policies). I am also a strong supporter of Barack Obama (though I favored Hillary Clinton during the primaries). I am now getting dozens of emails asking me how as a supporter of Israel I can vote for Barack Obama. Let me explain. I think that on the important issues relating to Israel, both Senator McCain and Senator Obama score very high. During the debates each candidate has gone out of his and her way to emphasize strong support for Israel as an American ally and a bastion of democracy in a dangerous neighborhood. They have also expressed support for Israel's right to defend itself against the nuclear threat posed by Iran which has sworn to wipe Israel off the map and the need to prevent another Holocaust. There may be some difference in nuance among the candidates, especially with regard to negotiations with Iran, but supporters of Israel should not base their voting decision on which party or which candidates support Israel more enthusiastically. In the United States, Israel is not a divisive issue, and voting for President is not a referendum on support for Israel, at least among the major parties. I want to keep it that way. I want to make sure that support for Israel remains strong both among liberals and conservatives. It is clear that extremists on both sides of the political spectrum hate Israel, because they hate liberal democracies, because they tend to have a special place in their heart for tyrannical regimes, and because they often have strange views with regard to anything Jewish. The extreme left, as represented by Noam Chomsky, Ralph Nader, Cynthia McKinney, Norman Finkelstein and, most recently, Jimmy Carter has little good to say about the Jewish state. But nor does the extreme right, as represented by Pat Buchanan, Robert Novak, Joseph Sobran and David Duke. When it comes to Israel there is little difference between the extreme right and the extreme left. Nor is there much of a difference between the centrist political left and the centrist political right: both generally support Israel. Among Israel's strongest supporters have always been Ted Kennedy, Harry Reid, Nancy Pelosi, Barney Frank, Hillary Clinton and Barack Obama. The same is true of the centrist political right, as represented by Mitt Romney, George W. Bush, Orrin Hatch and John McCain. Why then do I favor Obama over McCain? First, because I support him on policies unrelated to Israel, such as the Supreme Court, women's rights, separation of church and state and the economy. But I also prefer Obama to McCain on the issue of Israel. How can I say that if I have just acknowledged that on the issues they both seem to support Israel to an equal degree? The reason is because I think it is better for Israel to have a liberal supporter in the White House than to have a conservative supporter in the oval office. Obama's views on Israel will have greater impact on young people, on Europe, on the media and on others who tend to identify with the liberal perspective. Although I believe that centrists liberals in general tend to support Israel, I acknowledge that support from the left seems to be weakening as support from the right strengthens. The election of Barack Obama - a liberal supporter of Israel - will enhance Israel's position among wavering liberals. As I travel around university campuses both in the United States and abroad, I see radical academics trying to present Israel as the darling of the right and anathema to the left. As a liberal supporter of Israel, I try to combat that false image. Nothing could help more in this important effort to shore up liberal support for Israel than the election of a liberal president who strongly supports Israel and who is admired by liberals throughout the world. That is among the important reasons why I support Barack Obama for president. Alan M. Dershowitz is a Professor of Law at Harvard. His most recent book The Case Against Israel's Enemies: Exposing Jimmy Carter and Others Who Stand In The Way of Peace has recently been published by Wiley. No, Neel Kashkari is not a Jew. He is an Indian-American, born on July 30, 1973, in Akron, Ohio. He grew up in the Akron suburb of Stow, Ohio. He attended Stow–Munroe Falls schools before transferring to the Western Reserve Academy in Hudson, Ohio, from which he graduated in 1991. His parents, Chaman and Sheila Kashkari, are Hindus from Kashmir, India. As Interim Assistant Secretary of the Treasury for Financial Stability in the United States Department of the Treasury, he heads the Office of Financial Stability, the office set up to buy troubled financial assets from U.S. financial firms under the $700 billion U.S. Government Troubled Assets Relief Program. Time: Ancient Rabbis' Talmudic Cure for the Economic Crisis? Wow. Now I am really worried. Time magazine has despaired of contemporary expert opinion on the economy. 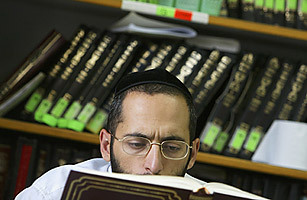 A religious Jewish Kabbalah (Jewish mysticism) scholar reads from the Talmud holy book during his studies at leading Kabbalist Rabbi Yitzhak Kadouri's synagogue August 4, 2004 in Jerusalem, Israel. The article starts with a picture of a Kabbalah student. Huh? Is Time being serious? I find that hard to imagine. So what's the purpose of this article? Is it a thinly disguised slap at all present-day economists and money managers? Is it a way to mock regulation of the market by suggesting that it's best left in the ancient religious libraries? Or perhaps Time is saying: You financial guys have led us so far into the wilderness. Even the ancient rabbis could have done better! In any event, I think this Time revelation comes with a big smirk. They are saying, here is a sideshow to entertain you in this bleak financial period. To me it seems that Time is in no way sincere or serious. I think "Kaballah" was a mistake. Perhaps someone used the word "halacha" and the reporter, unfamiliar with it, wrote down the more publicly-heard word, "kaballah". Nothing in the article had to do with mysticism or kaballah. "This is not about a calculation," said Coleman, who made his decision as the Jewish holiday of Yom Kippur ended Thursday night. "This is a reflection," he said. A reflection born of: "Having spent three days on the road in Minnesota listening to Minnesotans; having spent a day where I could sit back and reflect upon where we're going; having watched the stock market go to places where it hasn't been in our lifetime; and making a decision about, 'How you want to be perceived? How do you want to win a race? How do you want to serve in the U.S. Senate?' 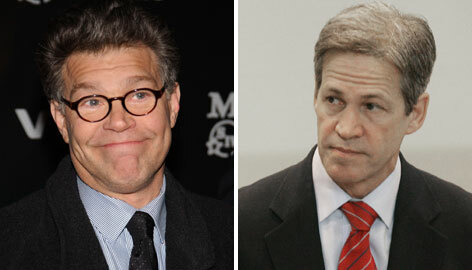 "
The Franken campaign didn't make immediate plans to change its ad strategy in reaction to Coleman's move. Last week, in the candidates' first general election debate, Franken said, to laughter: "We've been running ads against Norm Coleman's record ... so they're negative." Independence Party candidate Dean Barkley, who hasn't had the money to run TV spots, said Coleman's move won't undo the race's negative tone. "I think the tone of the campaign has already pretty much been set in stone," he said. Larry Jacobs of the University of Minnesota's Humphrey Institute said the move is clearly calculated. "The very claim of it not being calculated is calculated," he said. If Jacobs is right, then Coleman cheapens his religion by using it to disguise his tactical political change. And apparently the chazan was not as effective in Al Franken's shul since he was not as moved by his Yom Kippur davening to repent of running sleazy ads. 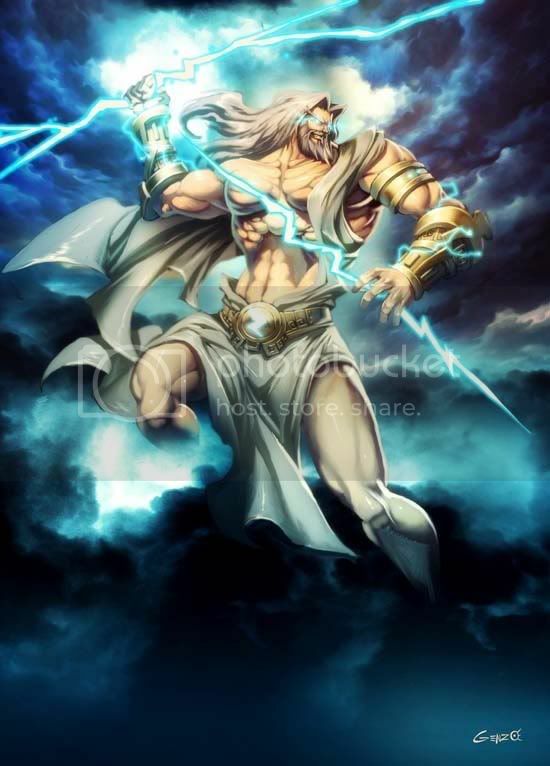 LA Times: McCain's pastor says contest with Obama is a cosmic struggle between Gods. This Republican campaign grows weirder and more erratic by the minute. The LA Times reports that McCain's pastor now has made the contest with Obama into a cosmic struggle between Gods - a religious war. Before McCain spoke, a Christian pastor offered a prayer that seemed to ask for divine intervention on his behalf. "There are millions of people around this world praying to their God -- whether it's Hindu, Buddha, Allah -- that [McCain's] opponent wins for a variety of reasons," Pastor Arnold Conrad said. "And, Lord, I pray that you would guard your own reputation, because they're going to think that their god is bigger than you, if that happens." The McCain campaign said it did not condone the prayer. "While we understand the important role that faith plays in informing the votes of Iowans, questions about the religious background of the candidates only serve to distract from the real questions in this race about Barack Obama's judgment, policies and readiness to lead as commander in chief," Wendy Riemann, McCain's Iowa spokeswoman, said. And by the way, please notice that the McCain forces not coincidentally use the term "race" when they should be saying "election." Another sneaky way to play the "race" card. H.T. to Henry for sending me this article from the New Republic which he retitles, "The New Dumber Nixon." Barracuda by Noam Scheiber: The resentments of Sarah Palin. Nice dirt but Palin is burnt toast and the culture wars have ended with the defeat of the right. Surprise! Bush and McCain lied to us. The surge has not worked. Christians in Iraq being kidnapped and killed. BAGHDAD – Hundreds of terrified Christian families have fled Mosul to escape extremist attacks that have increased despite months of U.S. and Iraqi military operations to secure the northern Iraqi city, political and religious officials said Saturday. Some 3,000 Christians have fled the city over the past week alone in a "major displacement," said Duraid Mohammed Kashmoula, the governor of northern Iraq's Ninevah province. He said most have left for churches, monasteries and the homes of relatives in nearby Christian villages and towns. The young and frum (religious) Orthodox Jews in Teaneck are finally and correctly rejecting John and Sarah and they are turning to Barak an Joe. For instance, perhaps because we have had an Obama sign on our lawn since before Purim, a the mom of a frum, young, educated and thoughtful family on our block told my wife today that they were for McCain but now they are seriously considering voting for Obama. Let me say that the tide is turning finally - in the right direction for Jews who care about Israel, who worry about the economy, who fret over health care, who want the best for our country, our society and above all for our children. The stock market collapsed last week. My friends tell me there is no support for the Dow until the level of 7500 and after that some historical leveling at around 5000. Authoritative people on TV are saying that we should recall the 73-74 recession when the market went down 50%. If you measure from 14,000, that will put the "bottom" at 7,000. If you start from the more recent plateau of 11,000, we are looking at coming to rest at 5500. But you don't need me to tell you all this stuff. "You could look it up." This is not just another scandal, or joke, or gaffe. Sarah Palin and John McCain are inciting violence, against Barack Obama and any of the millions of Americans who support his campaign. Anyone who is familiar with the recent history of Israel, and the assassination of Yitzhak Rabin by a right-wing extremist, will recognize the pattern. We must take this seriously, and make our protest against the McCain-Palin incitement to violence heard, before it is too late. I guess those of us who recall the Rabin assassination were more sensitive to the dangers of inciting-hate-speech, often invoked as the prime motive for the violent killing of the Israeli leader. By today the news had gotten much worse around the McCain and Palin campaign and its out-of-control rallies. The rest of the world has realized that the Republicans had unleashed a truly evil force in its campaign. “What I am seeing reminds me too much of another destructive period in American history. Sen. McCain and Gov. [Sarah] Palin are sowing the seeds of hatred and division, and there is no need for this hostility in our political discourse. “During another period, in the not too distant past, there was a governor of the state of Alabama named George Wallace who also became a presidential candidate. “George Wallace never threw a bomb. He never fired a gun, but he created the climate and the conditions that encouraged vicious attacks against innocent Americans who were simply trying to exercise their constitutional rights. “Because of this atmosphere of hate, four little girls were killed on Sunday morning when a church was bombed in Birmingham, Alabama. “As public figures with the power to influence and persuade, Sen. McCain and Gov. Palin are playing with fire, and if they are not careful, that fire will consume us all. John McCain, you are no fool, and you understand the depths of hatred that surround the issue of race in this country. You also know that, post-9/11, to call someone a friend of a terrorist is a very serious matter. You also know we are a bitterly divided country on many other issues. You know that, sadly, in America, violence is always just a moment away. You know that there are plenty of crazy people out there. Stop! Think! Your rallies are beginning to look, sound, feel and smell like lynch mobs. John McCain, you're walking a perilous line. If you do not stand up for all that is good in America and declare that Senator Obama is a patriot, fit for office, and denounce your hate-filled supporters when they scream out "Terrorist" or "Kill him," history will hold you responsible for all that follows. John McCain and Sarah Palin, you are playing with fire, and you know it. You are unleashing the monster of American hatred and prejudice, to the peril of all of us. You are doing this in wartime. You are doing this as our economy collapses. You are doing this in a country with a history of assassinations. Change the atmosphere of your campaign. Talk about the issues at hand. Make your case. But stop stirring up the lunatic fringe of haters, or risk suffering the judgment of history and the loathing of the American people - forever. The stock market collapse will stop at some level, maybe 7000, maybe 5000. But I am convinced now that the McCain/Palin ticket collapse is full and final. Their campaign is bankrupt. They have crossed over to the dark side. Yes, the wingnuts and some wealthy conservatives will stay with these characters. The ticket perhaps will get 35% of the popular vote. But at this rate, John and Sarah will win no states, not even Alaska. Rightly and appropriately, these purveyors of hate and evil will be shut out in this election with zero electoral votes. Reuters reports that the New Pope praises the WWII Pope for his SS activities ("Secret and Silent") regarding the Jews. Of course the evidence for all the "silent and secret" things that the WWII Pope did to save Jews will remain "silent and secret." And the identities of all the Jews he supposedly saved will remain "silent and secret." And as I have said in a previous post, if Jesus had taken this Pope's path through life, there would be a "silent and secret" religion called, not Christianity, but are you ready, yes, the SS religion!? In the latest step in the discussion about Pope Pius XII and the Holocaust, Pope Benedict has issued a ringing defence of his wartime predecessor and said he hoped his beatification “can proceed happily.” To critics who say Pius should have spoken out publicly against the Nazi slaughter of European Jews, Benedict said Pius’s “secret and silent way” was the right approach. This writer is a genius. Wanna know what is really going on? Read it! Erratic McCain Campaign in the Daily News: "Barack Obama's Friend Tried to Kill My Family"
"John Murtagh, a Republican Yonkers City Councilman who is running for State Senator. 'Barack Obama's friend tried to kill my family,' he said in a statement for the McCain campaign. "Murtagh was referring to a 1970 firebombing of his family's upper Manhattan home, when his father, New York State Supreme Court Justice John Murtagh, was presiding at a trial of Black Panther radicals. "The Weather Underground was suspected in the attack, although no one was caught." Tzvee says, Be afraid of McCain, Be Very Afraid. He may come after you next, with even less justification or fact. He acts without any logic. Be afraid for you life, your liberty, your country, your economy. No doubt "that one" delivered the knockout punch tonight in the debate. It is time to start declaring victory and anoint the victor. And may the goat - John "Azazel" McCain - as in the ancient ceremony of atonement - be cast down from a rough mountain cliff. A leading Italian biographer of Pope Pius XII has sharply criticised Rabbi Shear-Yashuv Cohen for recalling the controversy about the pope’s role in the Holocaust during an unprecedented address to a synod of Roman Catholic bishops at the Vatican. Andrea Tornielli, the Vatican correspondent of the newspaper Il Giornale who has written four books defending the wartime pope, said no cardinal could have ever spoken that way at a major Jewish forum in Jerusalem. Your sarcastic comments about the rabbi are most unwelcome. He is entitled to his expression of opinion and did so in most restrained terms. Perhaps it was insensitive of the Vatican to valorize Pius in front of a prominent Jewish leader. Anyone reading the record can see that Pius was not brave but timid when it came to opposing the vicious evil of the Nazi era. He surely did not follow the example of Jesus - publicly standing up for faith and belief regardless of the consequences. Imagine this if you will. Had Jesus followed Pius' path - all of that quiet diplomacy and secret activity - there would never have been a crucifixion, never a Christian narrative of any drama or meaning and hence, no Christianity. So in my view to honor such a man and his narrative of timidity is hardly the best way to serve your religion. But please note this very well. That's my viewpoint. That is not what Rabbi Cohen was saying. He was far more diplomatic and proper in his tone and his content. And your mock outrage at him is uncalled for. Why is Palin Not Humiliated and Crawling Under a Rock? I had students like Palin, so probably did most teachers. They never opened the book and never answered the assignment or exam questions – they were pure fakers. In college after a few weeks, once they found out that they were failin’ on account of that fakery, wink wink, they dropped my course and never showed up again. See, everybody went to school and so everybody knew a faker who walked away and hid when they were found out. But not Sarah Palin. She (like George W.) is different. Palin is destructive to our culture and all that we worked to build up in our educational systems. She needs to be humiliated and the message driven home that nobody can fake their way to positions of responsibility in a society that rewards merit and hard work. Will that happen? Yes and no. Yes among those who care about quality. No among the slacker populace that has spread under the Bush delusion. And now - how do you understand the nearly 100% solid block of Bush-Palin backers in our Orthodox community? This is a community that grew up out of academic blood sweat and tears – nobel prizes and 800 SATs; where knowledge of the Mishnah and Talmud and Codes and Commentaries and Responsa is valued above all wealth and the diligent study of Torah day and night is cherished above all activities. Where did all that "respect for learning" go? You remember that I have some thoughts to share about the Pope. I guess I wonder more each day what kind of power the Catholic Church has if it could stop neither the external threat of the Nazis, nor the internal epidemic of priestly sexual abuse. Some Jews have other things to say. Just as the Vatican is gearing up to commemorate the 50th anniversary of the death of Pope Pius XII, two Jews have spoken out to recall the darker side of his papacy. Their tone is neither shrill nor polemical, unlike many articles and books that have appeared over the years accusing Pius of being “Hitler’s Pope” and not doing enough to save Jews from the Holocaust. They do not seem keen to pick an argument with the Vatican just as it is preparing to hold what may be its most open defence of the controversial pontiff. But they raise difficult questions that remain even after Pope Benedict insisted his predecessor “spared no effort” to save Jews during World War Two. Yehuda Bauer, professor emeritus of Holocaust studies at Hebrew University, prefaced his remarks in The Tablet by saying he was a non-religious Jew just trying to reflect historical reality as best he could. He lamented the fact that Vatican archives for the wartime period are still not open and said Benedict offered no new documentary evidence to back up his claim that Pius had spared no effort to save Jews. “Until the archives are opened, no objective view can emerge,” he said. Pope Benedict will celebrate mass in honour of Pius on Thursday and the Vatican will open a photo exhibition about him on October 21. Since he has suspended the synod for the mass and invited all bishops to attend it, Benedict might make a major announcement, for example that he would soon beatify Pius. I wonder if Benedict or other Vatican officials will produce any new documentary evidence or any new moral arguments to answer the criticisms these two men have made. Times: Where can you get the best Prefab Sukkah? Is Mayor Michael Bloomberg Jewish?